It’s happened – Drake is no longer Number 1 on the Official Singles Chart. Drizzy’s 15-week stay at the top spot – the second longest consecutive stint in UK chart history – is over; his Wizkid and Kyla collaboration One Dance has slipped four places and finishes at this week’s Number 5. 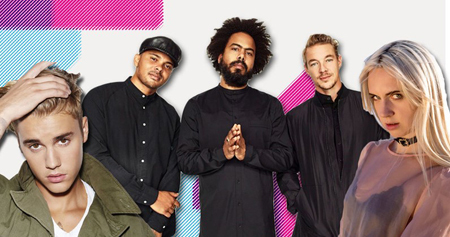 Our new Number 1 is Cold Water, Major Lazer’s powerhouse collaboration with Justin Bieber and MØ, which notches up 102,000 combined sales to take the top spot, including 5.56 million streams and 47,000 downloads. The track is Major Lazer and MØ’s first Number 1 single and Justin’s fourth. The rest of this week’s Top 5 looks like this: Jonas Blue and JP Cooper’s Perfect Strangers holds firm at Number 2, Calum Scott’s Dancing On My Own climbs one to hit a new peak of Number 3 and The Chainsmokers tumble one spot with Don’t Let Me Down. Elsewhere in the Top 10, Shawn Mendes’ Treat You Better climbs three places to a new high of Number 6, and Kent Jones’ Don’t Mind rises 10 to 9 following his performance in BBC Radio 1’s Live Lounge earlier this week. Bastille’s Good Grief is a big climber this week, vaulting to a new peak of 15, up nine places from last week’s 24. MØ is back again with her solo hit Final Song which climbs two rungs (17), and she is closely followed by M.O – the girl group’s first Top 40 entry Who Do You Think Of rises from 35 to 25. Christine and the Queens’ Tilted moves two places to a new PB of 27, as does Charlie Puth and Selena Gomez’s We Don’t Talk Anymore (28). Anne-Marie’s Alarm is a new entry in this week’s Top 40, up 23 placings to 32, and finally Snakehips’ Cruel featuring Zayn floats five places to 33. This entry was posted on Friday, July 29th, 2016 at 8:44 pm and is filed under Music News. You can follow any responses to this entry through the RSS 2.0 feed. Both comments and pings are currently closed.